​Nicki Minaj and Future Team Up for "NICKIHNDRXX Tour"
Nicki Minaj and Future have announced plans to embark on a joint tour this fall. Dubbed the "NICKIHNDRXX Tour," the rappers will kick off the string of shows in Baltimore on September 21. It will make just one Canadian stop, in Toronto on October 1. The North American jaunt wraps in Las Vegas on November 24. Early next year, the pair will then reunite for a European trek. It will open in Munich on February 21, eventually coming to an end in Geneva on March 28. 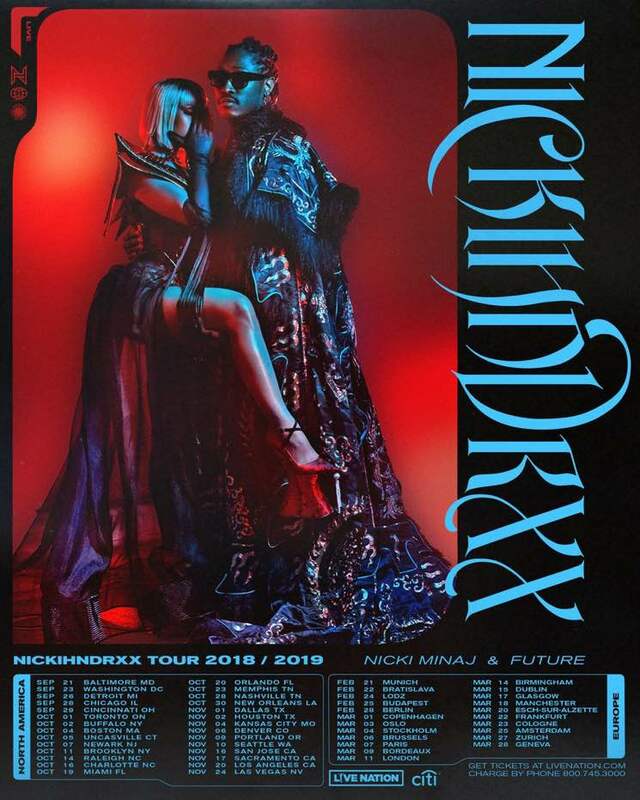 Tickets for the "NICKIHNDRXX Tour" will be available via pre-sales tomorrow (June 12), and will go on sale to the general public this Friday (June 15) at 12 p.m. EDT. See the full list of upcoming shows below. Minaj will also play Quebec City on July 7 ahead of the tour with Future. Minaj is slated to release her latest LP Queen on August 10. It features the singles "Barbie Tingz" and "Chun Li." Future, meanwhile, helmed the recently released soundtrack for Director X's Superfly reboot.